The DIY Rose Crown or Headband is our first DIY craft for the Costume Detective site. It was selected in preparation for Dia de los Muertos (Day of the Dead) and the upcoming Book of Life film. I think one of these crowns would be fun to wear to the premiere in October, especially with the butterfly. 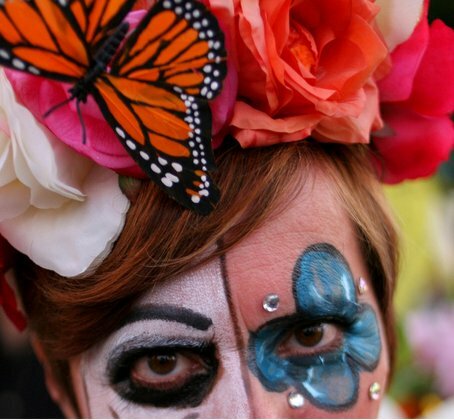 I am not too sure about wearing the Dia de los Muertos (Day of the Dead) face makeup. It might scare a few too many children. See DIY Rose Crown for Dia de los Muertos for instructions on making your own amazing flower crown.